IRELAND CAN EXPECT to be hit by more cold weather in the week ahead with wintry showers of hail, sleet or snow expected. The Irish Weather Network has forecast wintry showers across parts of the north and east with a fresh easterly winds blowing on Monday, Tuesday and Wednesday this coming week. Daytime temperatures will reach no higher than 6 degrees Celsius and will fall overnight to lows of -4 degrees Celsius. The weather will be dry, bright and crisp in the west and southwest of the country. On Thursday and Friday there will be a change to more unsettled weather moving in from the Atlantic as weather fronts push up from the south in strengthening southeast winds. The rain will be preceded by sleet and snow over the midlands and northern half of the country. There will be a rise in temperatures on Friday but they will fall back again to below normal next weekend as cold air comes in from the east. Met Éireann says that the outlook for the next week is for the cold spell to continue with indications of strong easterly winds and outbreaks of rain. 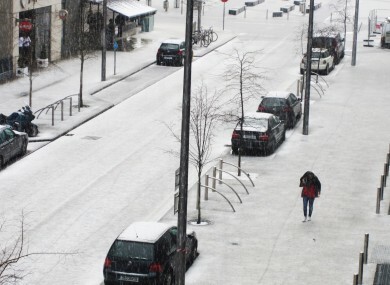 Yesterday: Did you see those hailstones in Dublin earlier? Email “No let-up: More cold weather forecast for the week ahead ”. Feedback on “No let-up: More cold weather forecast for the week ahead ”.